of what Instantwhip Foods has to offer. In 1934, at the very height of the Great Depression, Professor Dr. Frederick Smith and brothers Allyne H. and Clarence Smith introduced aerosol whipped cream in reusable canisters to the world. 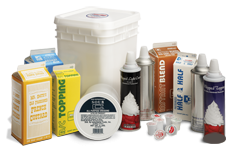 Since then, Instantwhip Foods has been providing premium dairy products, non-dairy products, and other food service supplies to the food & beverage and hospitality sectors. We offer a wide range of food service products from well-known brands, providing a convenient solution to all your food service needs. Proudly Serving the Food Service Industry for More than 80 Years! Our roots may be in our dairy products line, but we have evolved over time to find more and more ways to provide value to our customers. This has led us to expand to include a range of non-dairy items, baked goods and food service products. Our commitment to providing you the highest quality products available means that your operation can always be at its best. Make us part of the magic that you serve up every day! To find out what we offer and to become an Instantwhip Partner, visit us at www.instantwhip.com or call us at (800) 544-9447. Instantwhip knows about making things fast. We made whipped cream instant and we’ve done the same for food service companies! Our Partners Program provides a convenient, instant ordering platform accessible 24/7. Select your products from our easy-to-navigate online catalogue and they arrive on your designated scheduled delivery date. Products you need to keep your restaurant or café stocked is just a click away!